This to inform the general public and most especially all the prospective students of Federal Polytechnic Ede (EDEPOLY) that the Post UTME/admission screening application form for the 2018/2019 academic session has commenced. 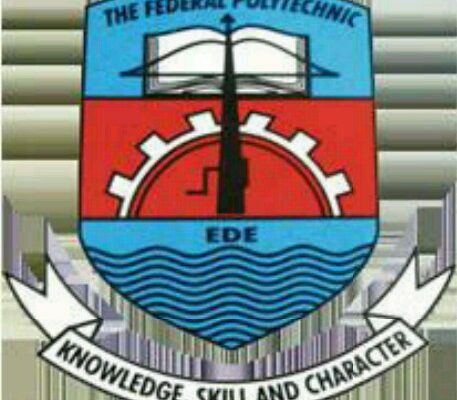 Federal Polytechnic Ede invites admission from suitably qualified students into her HND and ND programmes for 2018/2019 academic session. See below advert for more information. Applicants who chose the polytechnic and scored the required cut-off mark in the 2018 UTME (JAMB) result of 150 above and choose the institution as their first choice are eligible while does that didn’t can apply for DPT/RPT and also eligible to participate the screening. Candidates must have a minimum of 5 O’Level credit in SSCE/NABTEB/NECO including Mathematics and English Language in not more than two sittings. Interested and eligible candidates are to visit the registration portal: http://www.federalpolyede.edu.ng/entranceForm/ to complete their registrations. Note: The students’ union and management urge every individual or group of people not to have any monetary deal with anybody and avoid ghost registrars as the union nor the management will not be avail to bear or share the loss burden of anyone. All registration closes on Friday 31st, 2018. FEDERAL POLY EDE 2018/19 ADMISSION APPLICATION TROUBLE-SHOOTING FREQUENTLY ASKED QUESTIONS. My print out doesn’t display jamb score. ANS: The print out doesn’t display the candidates jamb score. My screening/exam date is not on my print out. ANS: The initial print out doesn’t contain the exam/screening date. You would be notified at a latter time to print a print out containing your exam/screening date and venue. When is the deadline for registrations. ? ANS: All registration closes on Friday 31st of August, 2018. Where can I register ? I choose ede as second choice but I scored 150(and above). ANS: If you like score 400. You are only eligible to apply for daily part time and part time. I choose ede as first choice but I didn’t score up to 150. ANS: If you like choose them as next of kin. You’re only eligible to apply for daily part time and part time. What if I register for a program I’m not eligible for? ANS: Congratulations for wasting your money. You stand no chance of being admitted. My O’level doesn’t meet the course I choose requirements. ANS: Make sure you choose a course that your o’level meets its requirement. Otherwise you’ll be wasting your money. Even after you’re admitted you will be asked yo withdraw when it’s discovered you didn’t meet the requirements. And it’s ALWAYS discovered so don’t even risk it. Message the page if you have doubts about your o’level. How can I be eligible for full time ? ANS: When you choose Ede as first choice and scored at least 150. When is the exam/screening date ? ANS: It hasn’t been fixed yet? My print out displays another person’s details. ANS: Log out and re-login in. Then try a new download. If issue persists try after a day or two. Can I come to the school to make a complain about a problem I’m encountering ? ANS: Yes, you can come if you’ve problem with your registration. You can call our Venture to help you with it. Where can i get past questions ? ANS: It’s sold on campus and around campus environs. Are we writing exam or doing screening ? What’s the difference between Full time, daily part time and part time ? ANS: Full time is a two year program and has the lowest school fees. Part time is a three year program and has the second highest school fees. Daily part time is a two year program and has the highest school fees. I have pass in my ND with two years I.T, can I apply ? ANS: Yes. Candidates with ND pass and one year I.T should not apply. Can I use awaiting result ? ANS: Yes. But be sure it’ll be ready when its needed. I registered the wrong info, what do I do ? ANS: Which of the Info’s?? If it is about the name or wrong o’level grade.. Its advisable the person registers a new one entirely .. But if it happens to be wrong course, he should continue, as the school would still open change of course for admitted ones.. But if it’s o’level, forget school this year. How much is the form ? ANS: Full time, N5000. Daily part time, part time & HND, N10000. (Excluding registration/bank charges. How can I get this information across to others ? ANS: Simply share this post and invite others keep checking this page. 21: How can I get instant updates ? What if I have other questions or issues different from those treated here ? DISCLAIMER: The number is not Federal Polytechnic Ede admin number, it’s just a reliable registration venture number that can help you with the registration and other related thing.